For sales queries, please contact us. For pricing, orders, and terms and conditions, visit our online store. To purchase paid technical support, click here. Software License Recovery - if you have lost your activation details, you may be able to recover them here. To activate your software, you need the Registration Name and the 9-digit License Number that you receive upon purchase. 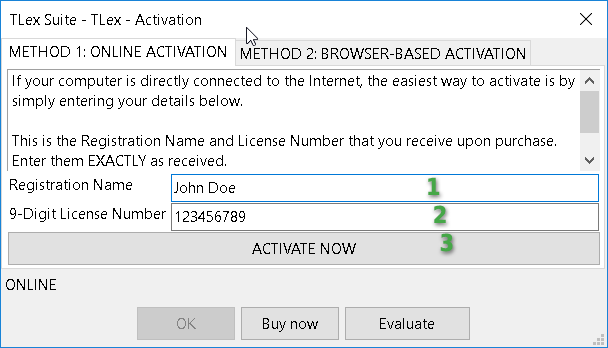 METHOD 2 (Online Activation using Web Form): The software will ask for a 16-digit 'Activation Code' to be entered in the activation dialog (this code is unique each time you install on a different computer). Use your 9-digit License Number to obtain this activation code: Click on the 'Get Activation Code Online' button; your web browser should open automatically to an online form where you must enter your Registration Name and 9-digit License Number. (If your web browser doesn't open automatically, or if you are activating from a different computer, click here to go directly to the form). You should then immediately receive the 16-digit Activation Code, which you can paste or type into the activation dialog. Please make sure to carefully enter all numbers/codes precisely. METHOD 3 If you have tried the above but still have problems, you may contact us for assistance. If you don't know what your 9-digit License Number(s) is/are, please try the License Number Recovery form. If that doesn't help you find your activation details, contact us and we will gladly assist. NB: Our software licenses do not expire. If you have purchased software from us years ago, you remain entitled to download and activate your software - click here to recover your activation details, or contact us. If you made a purchase, but did not receive your License Number: First, check your email program's spam (junk mail) folder - sometimes our notifications are misclassified as spam by email programs or Internet Service Providers. If you still do not find it, contact us with details of your purchase (e.g. product, reference number or invoice number). Visit our downloads page for a full list of trial software available. Sign up here for our beta testing program. If approved, you'll receive a complimentary license, and in return we ask only for feedback (e.g. bug reports and suggestions for improvements).